First of all The Daikin hybrid range is a masterpiece of technology, in fact, it is two technologies in one. The Daikin hybrid is the combination of a high-quality gas combination boiler and an energy saving air source heat pump. The Daikin hybrid heat pump is typically 40 % more efficient than a typical gas appliance. The heat pump generates heat by a cleverly designed plate heat exchanger and ‘pump’system. When the heat pump kicks in it moves air around a plate heat exchanger, and heat is generated. In Europe, 250,000 boilers have already been installed making Daikin Hybrids the shrewd alternative to an outdated heating system. The Daikin Altherma Hybrid Heat Pump qualifies for the Renewable Heat Incentive. Consequently, you will receive payment for the heat it produces. And as of the 20th of September 2017, the tariff rate will be 10.18p per kW unit of heat it produces. 2. The RHI (renewable heat incentive ) A typical example. Let’s say your property’s heat demand is 20,000 kW. If you sign up for the RHI scheme, you will get around you £2036.00 per year for seven years. Therefore in pounds and pence, the government will pay you 20,000 x 10.18p £2036.00 per year. That’s as much as £14,000 pounds towards the installation of the product, which easily covers the cost of the install and significantly reduces your bills. With the average install costing between £7,000 & £10,000, the Daikin hybrid is a good buy. Also, the heat pump qualifies for the 5 % vat rate. First of all, it will provide excellent performance all year round. The gas will kick in the winter months and the air source will work its magic in the summer months. Also, the smart hybrid logic control system will automatically choose the most energy and cost effective heat source. This system uses a small volume of electricity to initiate the heat pump and consequently produces a significant amount of heat. For every kilowatt of electricity utilized by the heat pump, it will produce about 3-4 kilowatts of heat absorbed from the air. It provides a tremendously efficient way to heat your home and significantly reduces the environmental effect of keeping you and your family comfortable. 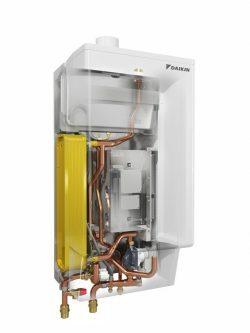 If your old boiler has seen better days, this new heat pump is right up your street. Because the system can be mounted on the wall quickly, it’s a hassle-free Installation and is very straight forward. Whats more there are no specific planning requirements, due to the size of the Hybrid system, it will meet all Permitted Development Rights. The installation is straightforward, and it will be up and running before the temperature has had a chance to drop. The Hybrid system has an outdoor unit no bigger than a standard air conditioning unit and the indoor unit that will replace your old boiler. It’s also perfect for homes with a single bathroom, and for households with a higher hot water usage; it can connect to a separate hot water cylinder. The system will work with existing radiators heaters, underfloor heating. Fan assisted radiators can also be linked to the system. It can also be coupled up to a solar thermal system to reduce costs even further. Unlike many old heating systems such as Oil or LPG boilers, you don’t have to be concerned about fuel distributions or storing the fuel. A heat pump produces no waste and doesn’t need any extraordinary care just a standard, simple annual examination. The only difference is the benefits it brings. check out this video, they’re also super quiet.